Wish you had been Jay Leno last night — able to ask the President of the United States a question? You can, at a new online forum for citizens launched yesterday. Called Ask the President, the project is a forum for citizens to submit and vote on questions for the President to answer at formal press conferences. 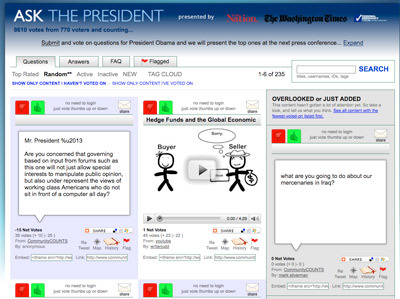 The forum enables national, transparent voting through www.communitycounts.com, a nonpartisan, open-source website that successfully gathered and submitted questions to presidential candidates during the 2008 primary. (Barack Obama, among other candidates, answered one popular question in November 2007, in the Ten Questions project backed by Personal Democracy Forum and the New York Times editorial board). Visitors can submit questions in writing or on video; vote other people’s questions up or down, with one vote per person; and directly inspect the code behind the portal. Ask The President will send a credentialed journalist to the next presidential press conference with a list of the most popular questions selected by the public. Backed by the coalition and citizens across the country, the journalist will appeal to the Obama administration to continue fulfilling its promise to provide the most open, interactive government in history by taking the first citizen-generated question at a presidential press conference. This initiative is already engaging Obama administration staff, in the spirit of cooperation and innovation, to build potential support and participation within the administration. Il peut y avoir un côté un peu démagogique là derrière: une fausse illusion de participation. Malgré tout, on peut saluer l'effort de l'administration Obama pour tester de nouveau outils "participatifs" au niveau de la vie politique et publique. Il ne faut pas oublier qu'Obama est le candidat qui a massivement (bien) utilisé les réseaux sociaux et le web viral pour sa campagne. 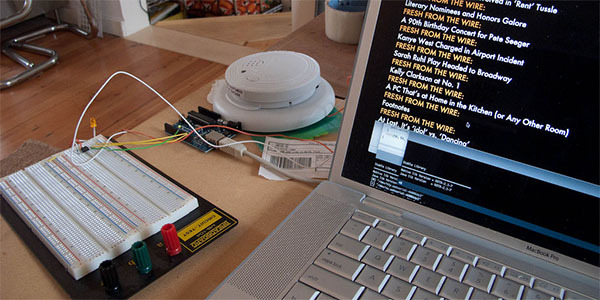 News Alarm [blog.blprnt.com] is a physical computing device that sounds a 85dB alarm when specific news stories are detected 'off the wire' of The New York Times. The tracked news data is based on the recently released New York Times NewsWire API, an up-to-the-minute stream of published items at The Times and The International Herald Tribune. The project consists of hacking an off-the-shelf smoke detector and connecting it with Arduino to a Processing application that connects to the API. The application is currently configured to sound if more than 50% of the NYTimes headlines contain the word 'aliens'. As the author puts it: "You never know... right?" I guess it would make real sense as a low-cost alert for tsunamis. En soi assez DIY, mais dans l'idée des projets, installations ou espaces qui auraient une "conscience géo-politique" ou "globale" que nous cherchons à développer. Voir l'API du New York Times. A noter aussi que le Guardian à Londres à mis sur pied une API similaire (voir article précédent). Social Weather Mapping [smalltalkapp.com] geo-locates recent tweets in the US that contain the terms "sunny", "rainy", "snowy", "windy", and "foggy". 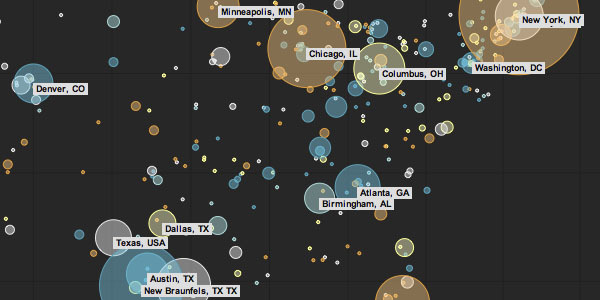 The size of the circles are determined by the number of tweets, and are colored by its current dominant weather. As sufficient "weather" data is aggregated, it can be used to form a multi-dimensional picture of the weather and the effect is has on our lives. The concept of mapping weather tweets was also used in Twitter Weather Map. Also on Flowing Data. Connaître le temps qu'il fait (ou qi'il pourrait faire), par un autre canal: en re-mappant sur la carte les commentaires sur le "temps qu'il fait" laissé dans Twitter... Dans un même ordre d'idée que le projet Listening Post (déjà blogué ici), établir des cartographies selon certain termes utilisés par les twitteristes pourrait révéler des "patterns" sociaux géographiques assez étonnants. “We are all in the process of creating e-mail 2.0,” David Sacks, founder of business social network Yammer said. Tens of millions of people are using social networks to stay in touch. The growth in such services is being heralded as the start of the real-time, pervasive web”. (..) “The complex nuances of relationships on social networks, with users having different degrees of openness with different friends or followers, further complicates the introduction of standards“. Yesterday I attended “World Wide Web@20″ at CERN in Geneva where Web founders celebrated the 20 years of the “Original proposal for a global hypertext project at CERN” (1989). Tim Berners-Lee, Ben Segal, Jean-Francois Groff, Robert Cailliau and others gave a set of talks about the history and the future of the Web. The afternoon was quite dense inside the CERN globe and I won’t summarize every talks. I only wanted to write down the set of insights I collected there. The main point of Berners-Lee was that “people just need to agree on a few simple things”, which was quite a challenged in the context of emergence of his invention: CERN. At the time, computers and IT in general was a zoo. There were many companies(OS), network standards were different (each company had at least one, CERN had its own… TCP/IP just began to appear form the research environment but were opposed by European PTTs and industry). Berners-Lee also pointed out the importance of the Lake Geneva area (”looking at the Mont Blanc this morning I realized how much you take it for granted when you live here”) and how the environment was fruitful and important in terms of diversity (researchers coming from all around the World). It was also interesting to see how the innovation per se was more about integrating ideas and technologies than starting something from scratch. As shown during the demo of the first webserver and by the comments on the first research papers about the Web, it was all a matter of hyperlinks, using an existing infrastructure (the internet), URI and of course the absence of royalties from CERN. People just needed to agree on a few simple things as TBL repeated. machine-readable data about ourselves as what Google (social graph API), Yahoo, Russia (yandex) are doing: putting big database of these stuff once you have this, you can ask questions you did not have previously. FOAF is an attempt into this direction too. A challenge is to lower the barrier to develop, deploy and access services for those devices, which should also be accessible for low literacy rates, in local languages (most of which are not on the web). One of the aim is to help people finding content and services even in developing countries. It’s also a way to empower people. The dreamed endpoint would be the “move form a search engine to an answer engine : not docs but answers” and definitely not a Web “to fly through data in 3D“. a certain vision of collaboration (facilitating content sharing between researchers), which can be traced back to Vannevar Bush’s Memex, Ted Nelson’s Xanadu, the promises of the Arpanet/Internet in the 70s (Licklider). the importance of openness: one can compare the difference between the Web’s evolution and other systems (Nelson’s work or Gopher). What would have happened if we had a Gopher Web? What is perhaps even more intriguing was that I felt to what extent how their vision of the future was still grounded and shaped by their early vision and by their aims. Their objective, as twenty years ago, is still to “help people finding content, documents and services”, the early utopia of Memex/Arpanet/Internet/Xanadu/the Web. 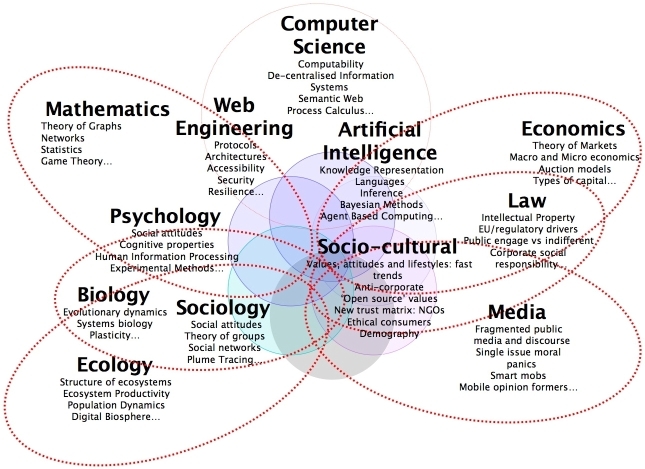 The fact that most of the discussion revolved around the Semantic Web indicates how much of these three elements had an important weight for the future. Or, how the past frames the discussants’ vision of the future. Curiously enough the discussion did not deal with the OTHER paths and usage the Web has taken. Of course they talked briefly about Web2.0 because this meme is a new instantiation of their early vision but they did not comment on other issues. An interesting symptom of this was their difficulty in going beyond the “access paradigm” as if the important thing was to allow “access”, “answers” and linkage between documents (or people). This is not necessarily a critique, it’s just that I was impressed by how their original ideas were so persistent that they still shape their vision of the future. Outre le passé du web (et cela reste toujours une histoire intéressante à entendre, comment les choses sont apparues, etc. ), quelques pistes ici sur l'avenir possible de notre "grand réseau" avec lequel nous vivons désormais en symbiose et co-développement.